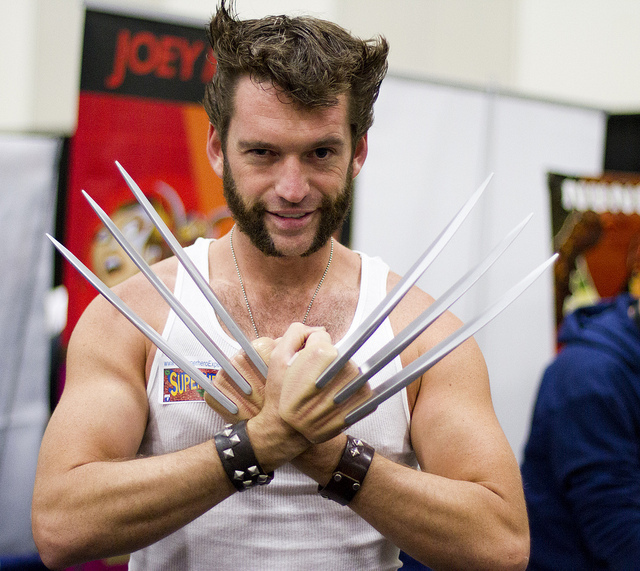 In 2000, when X-Men arrived on the big screen, Hugh Jackman’s Wolverine beard style became iconic. He followed up with 8 more movies ending with Logan in 2017. Over the years this beard style has become increasingly popular. It is so popular, it has it’s own nickname. Whether you are at a cos-play event, a Halloween party, or even a showing of the movie, wolverine facial hair is bound to be everywhere you turn. What exactly is the look, and how do I achieve it? This look involves growing a full beard along with a specific haircut. You don’t have to go with the hair style, but you definitely have to rock the badass facial hair for any chance of pulling it off. The first step is to grow a full beard if you don’t already have one. This may take you 2 months, 4 months, or longer. It will depend on your genetics and age. I mean, if you are 16, you probably will need to order a beard kit. If you can pull this facial hair wonder off at 16, you have incredible beard genetics. Next, you will need a beard trimmer to remove your mustache. You don’t want to shave it completely bare with a razor. You have to leave a little stubble for the look. Also, it is very important that you leave a little bit of your mustache that connects to your beard. The wolverine beard picture above will show Hugh Jackman’s face close up, and you can see that part of his grows up towards his upper lip then it transitions into his mustache stubble. Then, you will take your trimmer and make a cut straight down the center of your chin. Again, not trying to go for a baby smooth shave here. For the final chin work, you will need to edge your beard on both sides down into a sharp point. You will need a trimmer that can edge so that you can get those tight lines. We recommend the OneBlade on amazon. It is small and it will give you a perfect cut down your chin, and it will allow the detail work that you need for the sharp lines on your chin. These can basically be called Wolverine mutton chops because it is very similar with only a slight variation. These are basically full sideburns down the cheek without connecting to the mustache or chin hair. In order to get the look here, you need to let your beard grow naturally, and you do not need to clean up your cheek facial hair to make your beard line sharp. Just let it grow. You need to make sure that your side burn mutton chops are long, and you can actually use your fingers and hand to fluff them up. You don’t want to comb it down to make it smooth. Finally, you need to clean up your neck and set your beard line near your jaw line. Well, this is going to be a tough one. Which haircut are you going for? The most iconic Wolverine haircut would be from X-Men or X-Men Days of Future Past. X-Men 3: The Last Stand had too much hair and First Class had too little. In X-Men, the sides are styled straight back by using clay, and this make a seamless run from his mutton chops into his scalp. In Origins, his hair is much longer, and Hugh has a completely different look. Of course, he is still rocking the badass beard. In Days, it is similar to the original, except he has a gray patch on each side which gives a more mature, yet tough look. To get the Logan look, you gotta grow that stuff out. Don’t comb it, don’t brush it, and don’t trim it. You want shag, and you want to be unruly. All that said, he pulls it off. If I showed up to work with that beard, I would be asked to leave, but Hugh, he can pull it off. In Logan, Hugh Jackman’s hairstyle is like the old man Logan that is depicted in one of Marvel’s comics. After filming his final role as Wolverine, Hugh Jackman shared a post on Instagram and Twitter where he shaved off his beard. He used the hashtag #GoodbyeChops and noted that his wife would be very happy. What? She doesn’t like pure awesomeness?